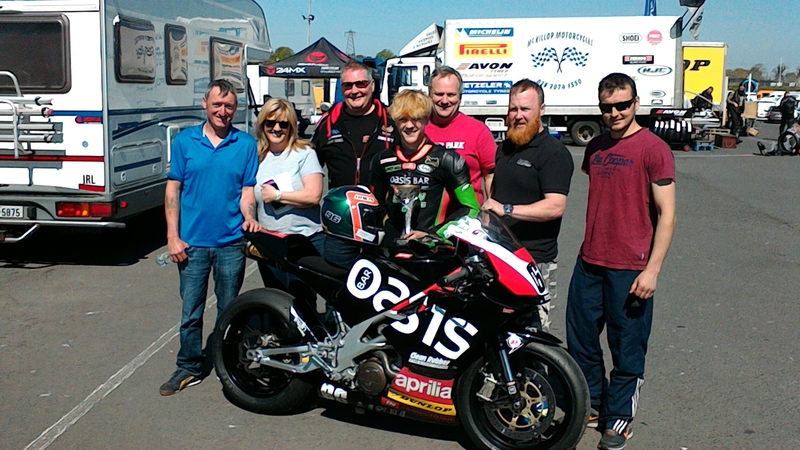 Donegal race team Irwin Racing made a dramatic Masters Superbike Championship debut at Mondello Park last weekend where the Oasis Bar Letterkenny and Clean Rubber backed team picked up five wins from six races. The teams two riders Caolán and Rhys Irwin were in dominant form, as they impressed the Masters paddock with their speed and professionalism. Irwin racing picked up their first ever race win last weekend at Snetterton, Norfolk, racing in the Thundersport UK Elite 600 class, where Caolán Irwin took a maiden Supersport victory. The team therefore arrived at Mondello Park full of confidence and both riders were in top form from the word go. First out for qualifying was Caolán and he finished his session quickest of the ‘Cup’ competitors to line up seventh from a field of fifty five riders. Rhys Irwin followed up with an even more impressive performance as he took pole for Lightweight Supersport on his first appearance in the class. Caolán’s three race schedule got off to a flying start with a lights to flag win in the Supersport Cup and fourth position overall. An improvement of more than a second in his lap time compared to qualifying was enough to move Caolán up to sixth on the grid for race two and from there he took another comfortable Cup victory on his way to fifth overall. For race three the Irwin Racing bike lined up fourth following another massive lap time improvement and once again Caolán got away cleanly to lead his class. On lap two while maintaining his fourth position overall the Oasis Bar Yamaha began to cut out and Caolán dropped to sixth place before the machine came to a complete stop at the start of the final lap robbing the teenager of a hat trick of wins. In Lightweight Supersport Rhys Irwin had it all his own way in race one as he led from start to finish and took fastest race lap, while winning by just over three seconds. Rhys upped his performance even higher for race two as he set a new Lightweight Supersport lap record on his way to win number two, this time with a margin of almost ten seconds. The final Lightweight race produced yet another comfortable victory for fourteen year old Rhys bringing the teams total to five.